One of Lancia genetic threads is superior chassis design. Not only with regard to suspension, but also chassis stiffness. A brief review of Wim de Weernink’s La Lancia provided data, and thus a summary could be prepared. What is torsional rigidity? Its the ability of an object (the car chassis or unit body) to resist torsion or twist. It is measured very simply: one end of the car (typ. front suspension mounts) is held fixed. Attached to the other end is a long bar, running either along the axle position or close to it. The bar is loaded with weight at a given distance, providing a moment arm. The amount of twist in degrees is then measured against the moment arm ( in ft lbs or Newton meters). Keep in mind the Lancia numbers were some 50 years earlier.An Aprilia is equal to a Dodge Viper. 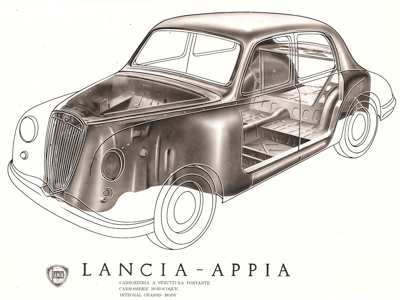 Lancia clearly understood chassis stiffness, and that corporate intelligence, even though not widely documented so far, rested within the company and showed up in the later cars as well. Thus there are Appias without rattles and Fulvias without chassis flex.Today’s production values are remarkably close to the Aprilia of 70 years ago. Progress has been made – note convertibles like the Lotus Elise are very stiff now even without enclosed framing. Anyone up for a visit to an engineering library (not much on the web) to learn more about comparables? Lancia was way ahead of the pack. They look pretty good even today.